Steel Homes (Director: Eva Weber): I’m not in the habit of reviewing shorts, but as it happens, I ran into the director of Steel Homes at a Hot Docs party and she eagerly pressed a copy of her film into my hand. The reason I usually don’t review shorts has nothing to do with the perceived quality of the films, and everything to do with my perceived lack of talent at writing about them. Nevertheless, here I go. 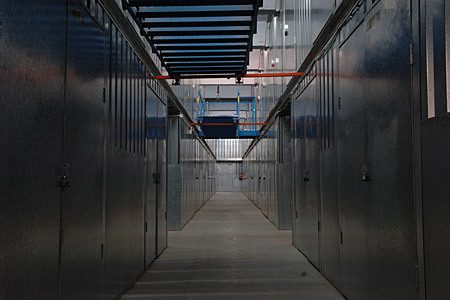 Eva Weber has taken a look inside a self-storage facility and has asked some questions. What kinds of people keep their stuff here? Why do they do it? Why are there some things we can’t keep with us and yet can’t throw away? In ten short minutes, the film elegantly attempts to answer these questions by means of a perceptive camera moving at a stately pace, accompanied by voiceovers from some of the tenants who rent lockers. These anonymous-looking buildings have popped up all over the developed world, places to store the overflow of “stuff” that we acquire during our lifetimes. But what emerges is that people aren’t just keeping excess material goods here. In many cases, they’re constructing shrines to lost relatives or even to their own lost youth or ideals. In one case, a man has lost his home and is storing things here until he can get back on his feet again. His shrine is to a lost life as well, perhaps the life of the man he thought he could be. By focusing only on the sterility of the facility itself, and never on the human objects it contains, the cinematography is superficially distancing, but it only makes the voiceovers more heartbreaking. As these very articulate subjects recount their attempts to grasp immortality by hanging onto a person or a memory, the images reinforce the futility of that quest. Perhaps the best thing I can say about this short documentary is that it left me wanting more. This entry was posted in Documentaries, Film Festivals, Hot Docs and tagged #hotdocs09, shorts. Bookmark the permalink. When I think of shorts, I wish there was a place (say iTunes) where I could buy them for $0.99. Ilka, the iTunes store in the US offered a bunch of free shorts during the recent Sundance Film Festival. I see this as a good sign of things to come. You can find shorts on the iTunes store but it’s a bit of a scavenger hunt. Hopefully it will become easier. And the prices will come down.